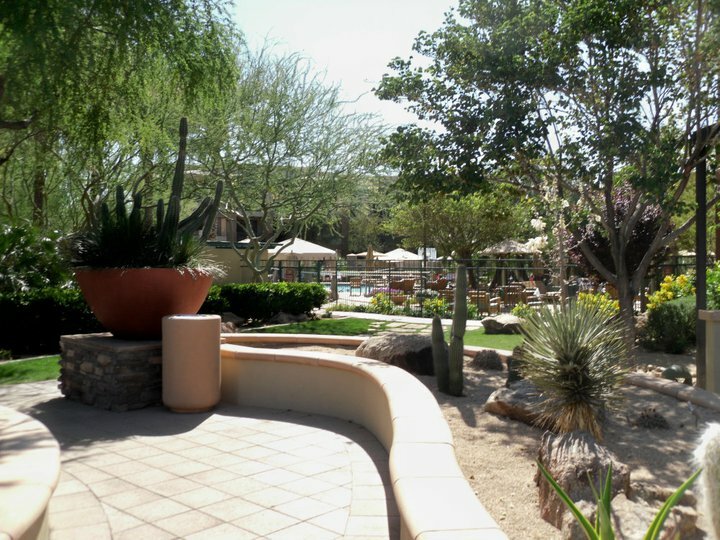 I first stayed at the main Westin Kierland Resort back in 2005 when I first moved out to Arizona. I have continued to stay at the main resort since then because it’s far enough from home to call it a vacation, yet close enough to not be stressful; it happens to be next door to one of my favorite shopping centers, and it is home to one of the best mojito bars in the Valley. As I stated in my upcoming trip annoucement, my mom made good use of my Starwood Vacation Ownership week at the villa side of the resort this time around. I had previously toured the property, but oddly enough, had never stayed there. I thought for sure that we would find ourselves over at the main resort almost everyday since it would be far superior to the villas, but we only ever went to the main resort to enjoy our mojitos at Deseo’s! The rooms were quite nice- we were lucky enough to enjoy a two bedroom lock-off the first night since I had booked one night for myself before leaving my family to their vacation for the week. The premium one bedroom side of the lockoff is amazing: a huge kitchen, living room with fireplace, double vanity sinks in the bathroom with a giant walk in shower and jetted tub, and a nice Heavenly king bed. We commented that it would be a nice one bedroom condo for retirement! The smaller one bedroom side was similar, but did not have the larger kitchen, the fireplace, the walk in shower or the double vanity sinks. The bedroom also had a queen bed instead of the king. Our rooms were in Building 2, on the 3rd floor, which overlooked the activity pool and was next to the lobby area. There were absolutely no noise issues at all. Every day was essentially the same- wake up, head down to Building 1 to the McDowell Market for some coffee and pastries. The prices for a hotel were quite reasonable and the coffee, which happens to be Starbucks, had free refills. Then, it was off to the relaxation pool, which is geared toward adults-only. It was quiet and the wait staff was extremely attentive. As with any Starwood Vacation Network property, you are welcome to bring your own food and drink to the pool, but we chose to eat and drink from the hotel menu. The food and beverages were very good, and again- the prices were not outrageous. My cheese quesadilla was only $2.50 and my diet pepsi was also around $2.50 and had free refills! The villa side of the resort is very nice for families since there are many activities at the pool area and beyond, full kitchens, and the bedrooms are separated by doors in the rooms. I personally love any resort that keeps the kids area separate from the adult area, as many couples travel to relax and unwind from stressful jobs and life situations. Children want to run around and have fun and the activity pool area allows that! Also, for those who want adult activities, the resort boasts amazing golf and also a very nice spa. The spa is a bit pricey, but offers some unique desert-based treatments that you won’t find anywhere else. Also, don’t forget those mojitos in the evening! I could write a lot about what we did each evening- the restaurants, the shopping, etc- but I end up eating and shopping in this area quite often, so I’ll leave it as feel free to contact me if you have any particular questions. However, I will note that we chose to keep things relatively laid back, so we just ate at The Cheesecake Factory, PF Chang’s, Grimaldi’s, Grazie, and Maggiano’s. I can give recommendations to other higher end restaurants in the area. We did relatively minor shopping at Kierland Commons, so it’s not even worth commenting on. I realize this is a fairly short review, but please feel free to ask any questions you may have! I always seem to be booking a night there for whatever reason!